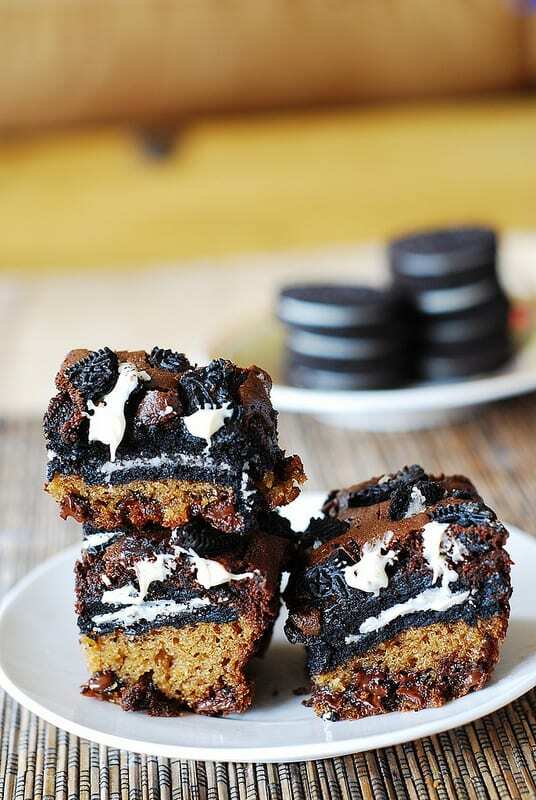 Slutty brownie is basically 3 types of everybody’s favorite sweets combined in one tall dessert bar: brownies + oreos + blondies. 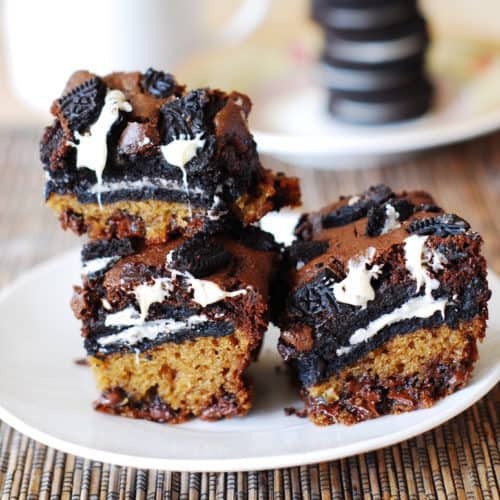 Slutty brownies – I must have been one of the last persons on the planet to notice these floating around on the internet (like a year late), and even then it took me a while to actually make them: slutty brownies have not made it to the top of my to-do list for quite some time – and they should have! Especially after I’ve added white chocolate chips to the brownie batter to add more creaminess and gooeyness! Having finally baked them, I can tell you that eating a slutty brownie is very much like having a cake, a brownie, a blondie, a layered dessert bar, or a fudge chocolate – all combined in one! Brownies can be either cake-like, or taste more like a fudge – the texture depends on your flour-to-butter ratios and the baking times. In this recipe, I wanted the brownies to be very fudgy and super chewy, which is why I am using a low proportion of flour to butter. Less flour and more butter (proportion-wise) is what makes brownies so fudgy. Also, remember to sift the flour before measuring with cups, so that you don’t over pack the flour and don’t accidentally use more than what the recipe calls for. Do not overmix blondie batter or brownie batter – just mix enough to combine dry ingredients with wet ones. 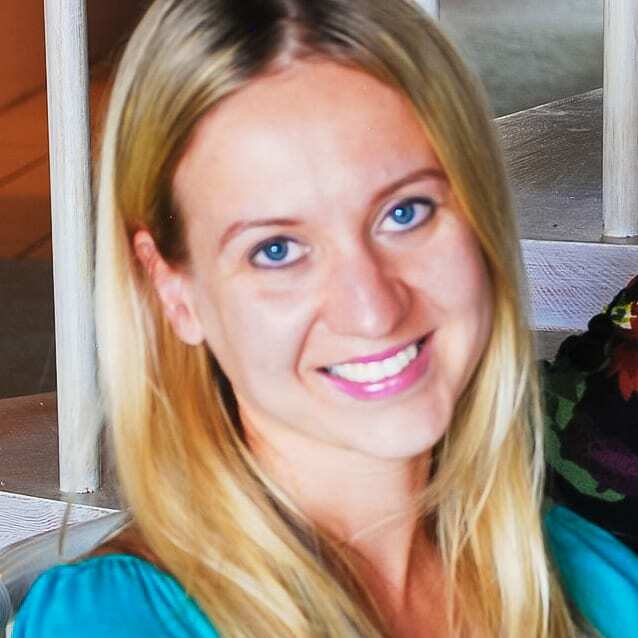 Overmixing will invariably result in a tougher texture. I strongly recommend under baking them which will guarantee that you will get chewy, fudgy, rich and moist dessert bars. If you’re feeling especially lazy (or busy), you can even get away with using your favorite store-bought brownie mix and blondie (or chocolate chip cookie dough) mix for layers. Just remember to not overbake, and you will get an excellent and rich dessert! Slutty brownie is basically 3 types of everybody’s favorite sweets combined in one tall dessert bar: brownies + oreos + blondies. These slutty brownies use white chocolate chips. Fun dessert recipe! Beat melted butter with brown sugar, using electric mixer, until smooth. Add eggs and vanilla extract and continue beating. In a separate bowl, combine flour, baking soda, and salt. Add to the butter mixture and beat just until combined, without over-mixing. Stir in chocolate chips. Mix sugar, cocoa, baking soda in a medium bowl. Add melted butter to the mixture of dry ingredients, whisking to combine. Add boiling water and stir to combine and thicken the mixture. Add vanilla, eggs, beating using electric mixer to blend ingredients together. Add flour and salt and stir until just combined without over-mixing. Stir in white chocolate chips. Line the bottom and the sides of a 9×9 baking pan with aluminum foil. Grease the foil with baking spray. Layer the blondie cookie dough on the bottom of the baking pan. 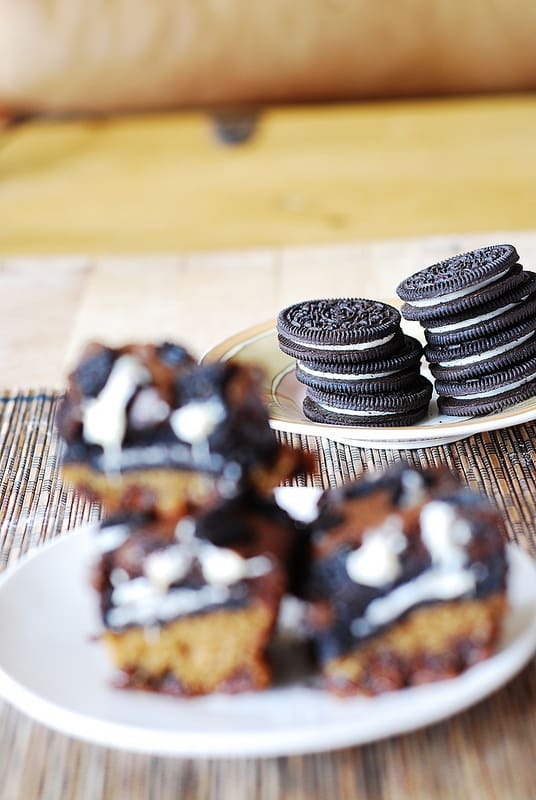 Layer a single layer of oreos on top of the blondie cookie dough. Pour the brownie batter over the oreo layer. 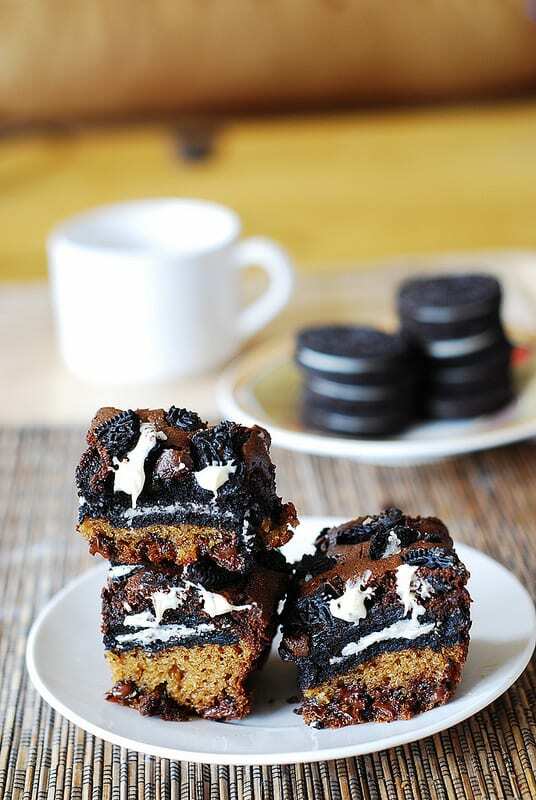 Break some oreos into smaller pieces and sprinkle them over the top of the brownie layer. Bake for 35 minutes or until set on top in the middle. 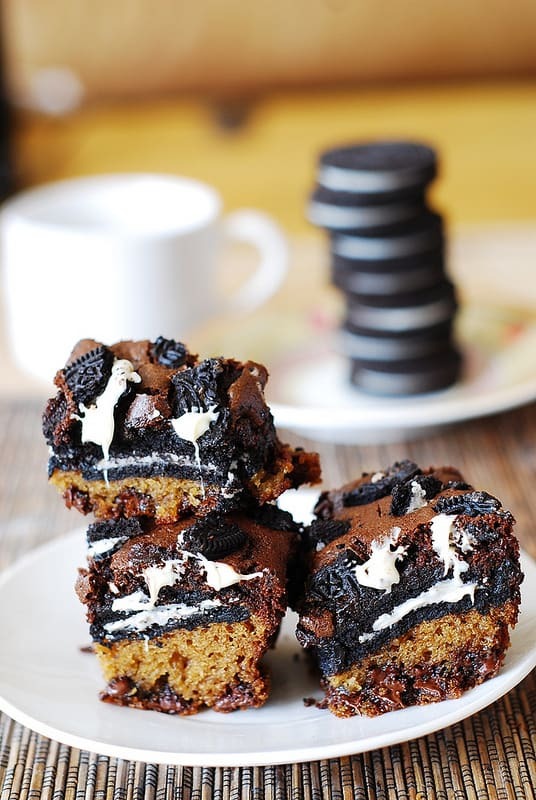 You want to underbake these slutty brownies rather than overbake them. Cool on rack before cutting into slices. Now I know I heard about slutty brownies way after you did. These look decadent!! Like, dripping decadent. Yes, please. Love the name! these do look amazing!